There are many ways to cook asparagus. If you want to know how to cook asparagus, below you will find information on how to bring out the best in this versatile vegetable. Asparagus is a tasty treat that comes into season around the end April, depending on what part of the country you're in. Asparagus season doesn't last very long, so take advantage of this time of year and eat as much as you can! One thing to keep in mind when cooking asparagus is that freshness counts. While asparagus tastes good many different ways, its flavor is best when it's freshly cut. If you do a side-by-side comparison, you'll probably discover that freshly cut asparagus is noticeably sweeter than the same vegetable after it's been sitting around a few hours. Try to buy it as close to when you're going to cook it as possible and, if you must hold onto it for a while, store it in the crisper drawer of your refrigerator. Grilling asparagus is perhaps the easiest way to cook it. All you need to do it lay your stalks on the grill, perpendicular to the bars so they don't fall through. Place them away from the heat so they do not burn and turn them occasionally if you see them start to turn brown. Like broccoli, asparagus has a built-in cooking timer - when they turn a deep, dark green, it's time to take the off the heat. Depending on how hot your grill is and how "done" you like your asparagus, you should grill them for about 4-6 minutes total. If they are cooking too fast and beginning to burn, move to a cooler part of the grill. 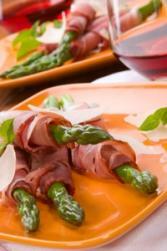 Steamed asparagus is very popular because it's easy to do. The only real way to mess up the process is by steaming it for too long, which will result in limp, stringy stalks. The key is to steam it just long enough for the stalks to stay crisp, but not so long that the flowers go soggy.Your best bet for steaming asparagus is to get a large pan with a steamer basket that's long enough to accommodate the length of your stalks. Alternately, you can purchase a special asparagus steamer that is made for just such a job. Bring one inch of water to a boil in a pot. 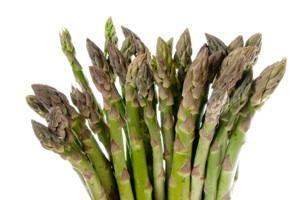 Lay your asparagus in a single layer in a steamer basket and set the basket over boiling water. Lower heat to low and steam gently for 2-5 minutes, depending on how tender you like your asparagus. Asparagus can be wrapped in tasty things before cooking. Sautéing asparagus is an especially tasty way to cook it. You can use any kind of oil you want, from sesame oil to bacon fat. If you like, you can cut your asparagus into thirds and cook in pieces or, if you have a large enough sauté pan, you can cook the stalks whole. Heat the oil of your choice in sauté pan over medium heat. Once the oil starts to shimmer, add asparagus. Agitate asparagus until stalks turn a deep, dark green and are tender but still crunchy, about four minutes. Raw and right out of the ground! Bures Berry Patch has lots of asparagus facts and folklore available for your perusal. Yum Sugar talks about how to select and store asparagus.